Select your country so as to get support for your region. If using OBS with Razer Ripsaw – I'm getting a red LED light on my capture card, and it is not responding despite being plugged in. Why? Add the Ripsaw again as a Source and see if this resolves your problem. If using OBS Classic with Razer Ripsaw – configured settings in OBS not saving, always reverting to default. What do I do? You need to run OBS Classic as "administrator" in order to give it a high enough priority in your system. To do this, simply right click OBS Classic icon > "Run as administrator." General tip: It's always a good idea to run OBS as an administrator, for all purposes. This will help give it priority in your system. When I connect my HDMI cable from my gaming PC to the Razer Ripsaw, and the HDMI output from the Razer Ripsaw to my monitor, the resolution seems to stretch. What is happening? This is a Windows issue with a simple solution – go to your computer's Display > Screen Resolution settings and click the text link "Make text and other items larger or smaller". From here, you can reconfigure your monitor's display of text and other items according to your preferences. How can I stream audio from my game through the Ripsaw to my streaming PC, as well as pick it up on my headset? We recommend using a digital audio splitter like VoiceMeeter which is really easy to use Voicemeeter - it essentially sends audio both to your Ripsaw and headset/speakers. If using OBS Studio with Razer Ripsaw – I can't hear any game audio? Check that in OBS Studio, the audio setting is set to "Output desktop audio" rather than the default "Capture audio only." In addition, OBS Studio works slightly different from OBS Standard, in that you'll have to add the Razer Ripsaw under Audio Settings. See this thread here for more possible info Adding Extra Audio Channel in OBS Studio. How do I set up the Razer Ripsaw to work with OBS or XSplit? We've produced guides for setting up OBS or XSplit to work with the Razer Ripsaw. You can find those at www.razerzone.com/ripsaw. How do I record PS4 gameplay with the Razer Ripsaw? You'll need to first disable HDCP on the PS4. To do that, on your PS4, go to Settings > System > uncheck the Enable HDCP box and you should be good to go. I'm getting stuttering, or frozen images in my recordings from the Razer Ripsaw. Why is that? Try lowering your capture resolution to 720p (if it was set to 1080p) in order to ensure lower CPU usage. The performance of the capture is heavily reliant on the performance capability of the machine you're streaming to. Why can't I get the Razer Ripsaw pass-through video to appear on-screen? Please ensure you install the drivers as delivered via Razer Synapse in order to output/view the pass-through video. Why do I get a "no-signal" message on my screen? 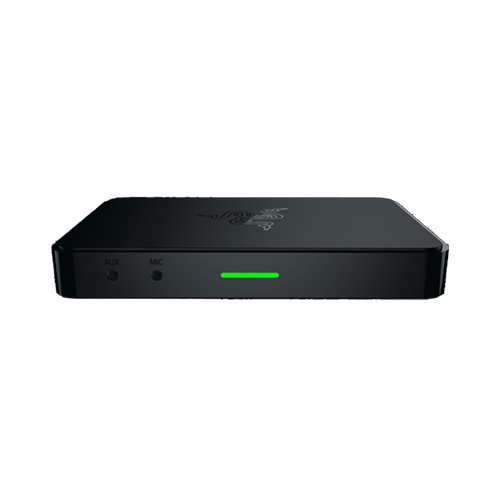 Ensure that the Razer Ripsaw is plugged into a USB 3.0 port for the device to function correctly. I am using a Windows 7 machine. I am having trouble getting the Razer Ripsaw to appear in OBS / XSplit even if it appears on Razer Synapse. The LED indicator is displaying red. What should I do? There is a known issue with Windows 7 that requires security updates to be installed on the machine for the Razer Ripsaw to work correctly. Security updates can be downloaded here Microsoft Security Advisory 3033929. Do I have to use HDMI pass-through to my main (gaming) monitor? Yes, the Razer Ripsaw is designed to offer pass-through via HDMI only. How do I set up the Ripsaw to work with my 144Hz gaming monitor? This is an internally tested method to ensuring full 144Hz gaming monitor performance, while allowing the Ripsaw to stream at 60Hz. On your gaming PC, make sure your 144Hz gaming monitor is plugged in via DVI. Then ensure to plug your Ripsaw in via HDMI. On your gaming PC, go to Screen Resolutions, and have your Ripsaw act as an extended desktop [Gaming monitor = 1, Ripsaw = 2]. Download and open OBS on your gaming PC. Set up OBS to 1920x1080 – 60 FPS in your Ripsaw-virtual desktop, NOT your gaming monitor screen. Go into Advanced Settings and disable encoding during preview. The resultant stream to OBS will be at a very minimal footprint on your gaming PC. Add source of game from Gaming Monitor 1 to OBS. On your streaming PC, open OBS and add Ripsaw source as 1920x1080 at 60 FPS. Then drag OBS on the gaming PC across into the preview on the streaming PC – so basically, your streaming PC is capturing the mirrored footage on the Ripsaw-virtual extended desktop at 60Hz, from your Gaming Monitor 1 running at 144Hz. Make sure to run full screen preview on the gaming PC for OBS. Note: The reason for running OBS on the gaming PC is so that a scene can be set up at 1080p60 with minimal tearing. If you just "Clone" desktop instead of "Extend", you will be having 200+ FPS running through the 60Hz max Ripsaw, thereby causing tearing. If using OBS Studio with Razer Ripsaw – why does my recorded gameplay footage / stream colors look washed out in comparison to the actual game? Make sure that the Razer Ripsaw's YUV Color Space and YUV Color Range settings are exactly the same as OBS' own YUV Color Space and YUV Color Range settings. They may not be the same by default, and as a result, may cause washed out colors in the recorded footage. Do you have spare parts available? We do not carry internal parts such as mouse sensors. However we do have certain spare parts available for purchase from the Razerstore: here. How can I contact Razer? If you were unable to find the answer to your question(s) in our FAQ, please don't hesitate to contact us here or call 1-888-697-2037. How can I modify or disassemble my Razer product? We cannot help you in modifying or disassembling your Razer product since that will void the manufacturer's warranty on the unit. How do I request or purchase replacement parts for my Razer product? For a complete list of our current spare parts and accessories please click here. If the item you need isn't listed, please don't hesitate to contact our Customer Support team here. I have a coupon / promotional / gift voucher code for the Razer Store. Where can I enter the code so I can use it to purchase products? From your shopping cart page on the Razer Store, please check the box labeled "Enter Promo Code." Enter the code into the box and click "Apply Code." The total price after should reflect the discount. I think my Razer product is defective and would like an RMA / exchange. If you were unable to troubleshoot and resolve any issues you are having with the knowledgebase (FAQ) and you feel your product is still defective, please don't hesitate to contact us here or call 1-888-697-2037. I would like information on future Razer products. Unfortunately, customer support has no information on future product or driver releases. For any information regarding future products please visit our website or our social media outlets. What are some examples of a "Proof-of-Purchase" to provide when initiating an RMA? A valid proof of purchase is defined as a dated sales receipt from an authorized Razer Reseller. The receipt must show the 1) product description and 2) price. Invoice slips and e-mail order confirmations can be considered on a case-by-case basis. Why does Razer require a proof-of-purchase? Razer must verify that the product is within the specified warranty period and that it was purchased from an authorized reseller. Products purchased from unauthorized dealers are often used, counterfeit, re-boxed, defective or gray market goods. These units may also not be designed and packaged to work in your country and may not meet all legal and safety requirements. Razer will not be able to honor a warranty on products purchased from an unauthorized dealer or that are out of the warranty period. If you purchased product from an unauthorized reseller, all support and warranty issues should be directed to that reseller. Contact Support Get support by phone, chat or email. Learn more about warranty Razer Recycle Program Razer has partnered with DNA Group to provide programs in recycling Razer products free of charge.